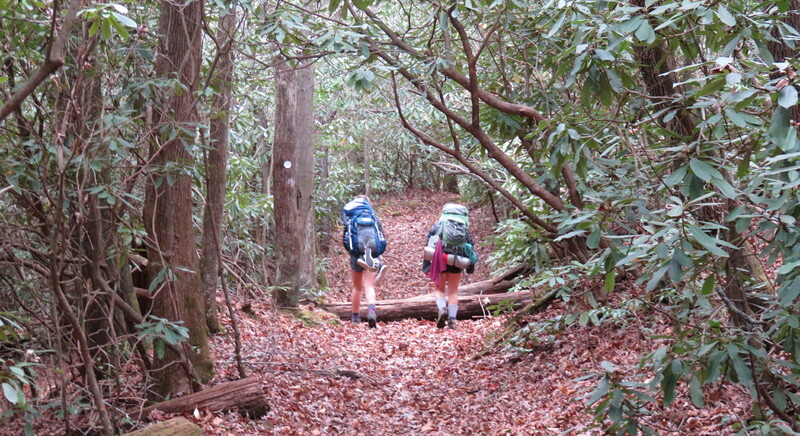 Thirty-four Cary Academy students — backpacks loaded, trekking poles at the ready — were finally off the bus and chomping to hit the trail. We woke at dawn, and five hours later we were ready to embark on our four-day hike through the Wilson Creek area in Pisgah National Forest. Hold up. What’s that huge pile of stuff sitting on the ground at the trailhead? Hot dogs, peanut butter, cream cheese, bagels, oatmeal, pop tarts, pancake mix, dehydrated potatoes, hot chocolate, marshmallows, cooking pans, gas canisters, stoves, water purifiers, first aid kits, bear bags. That’s our group gear, and we are not going to make it very far without it. In the excitement leading up to the trip, everybody had set personal goals and taken care to pack their bags for the journey. By all accounts, everybody’s individual pack was already full — and now we needed to make room for the gear that we would share. Gear that was essential to a fun and successful hike for all. As each person opened their packs and crammed in more than you thought was possible, the group leaders broke out the scale. The goal in sharing gear on the trail is to balance the distribution based on the size of the hiker, and it was important that everybody was aware of the size of their packs. I love to go hiking with our Outdoors Club. The trips happen at the end our trimesters, and the timing couldn’t be better for a change of scenery. At the end of any academic term, folks are exhausted. At Cary Academy, our first trimester is the longest. Adding in before term activities like professional days for employees or sports practices for students makes it even longer. But it’s not just backpackers who carry group gear. We all do. Faculty work collaboratively to develop new curriculum, mentor a new colleague, or to sponsor important activities. Students serve as teammates and run clubs, conferences, and service projects. When I travel with the speech and debate team, I always marvel at the collaborative nature of their prep work. They naturally mentor and support one another, sharing evidence and ideas. The same can be said for somebody who mentors a peer to hit an outside jump shot or an overhead smash. Closer to home, you will find a Cary Academy junior or senior online nightly, using Skype for Business to tutor a student in a younger grade — helping them navigate a challenging assignment, crucial lab, or threshold concept for a course the elder classmate took the previous year. Along our journey in Wilson Creek this fall, a few students stumbled and twisted their ankles or knees. We paused along the way to redistribute their group gear, so we could all finish together. The same thing happens quite regularly during any school term. A colleague falls ill, and a few peers chip in to cover their classes. Somebody has a death in the family, and students or faculty do the needful. A new idea excites a group or club, and everybody falls in to make Friday Night Lights or the Drink Cart Challenge a reality. We all do what we can, when we can — even if that means taking just a bit more than we thought we could. Of course, this same goes for our parents. Every year, they step up through the PTAA or our Annual Fund to provide activities and resources that enable us to do special things for our students. This is the ultimate in group gear mentality: volunteer when you have the time; give to the annual fund when you have the resources. Some years you can do more, other times less. In the end, we all benefit from the shared effort — and the school is a much, much better place for it. As much as I love going out with the outdoors club, I have to say I love coming back too. Yes, I am ready for the shower and the soft bed … but more than that I love to see the students meet their parents in the parking lot. They have just accomplished something very difficult, and each of them will have a story (or several) to tell. This also true at the end of the term, the end of a year, and when each one of our students walks across the stage at graduation. The group gear we share makes each of these journeys possible. Thank you for what you do to assist us along our way, and Happy Thanksgiving.